Culture and Tourism Minister Ricardo Miranda (L) stands next to Jennifer McCurdy, CEO and president of the St. Albert and District Chamber of Commerce. A male driver died after his car hit a concrete barrier westbound, throwing him from the vehicle, which then exploded into flames around 4 a.m. Monday. Edmonton police are urging drivers to take it slow after three fatal collisions this weekend, two of which involved motorcycles on Sunday night. More than 450 drivers have been caught speeding along Groat Road since mid-June, sparking a warning from Edmonton police to slow down. One man was killed in Red Deer on Wednesday in a collision between a motorcycle and a city bus. A man was rushed to hospital with serious injuries Monday night after police said he appeared to have struck a lamp post with his motorcycle before being thrown from the bike. 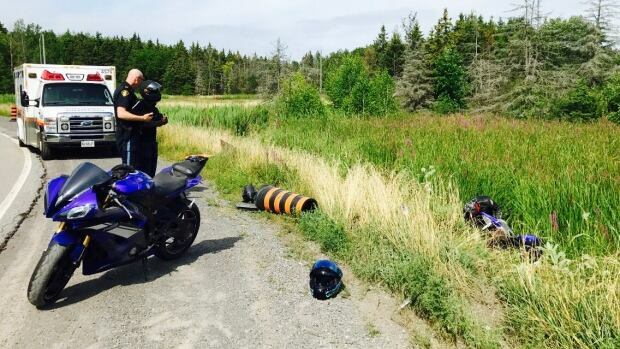 One man has minor injuries after two motorcycles drove into a ditch in the city's south end Monday morning. One man is dead following a two-vehicle crash involving a motorcycle along the city's western border. A judge has ordered a man from Red Deer, Alta., to pay back more than $100,000 he admits he stole from a religious charity he worked for. Life may never be the same for an Edmonton couple who were involved in a crash while on a motorcycle trip through the Shuswap.